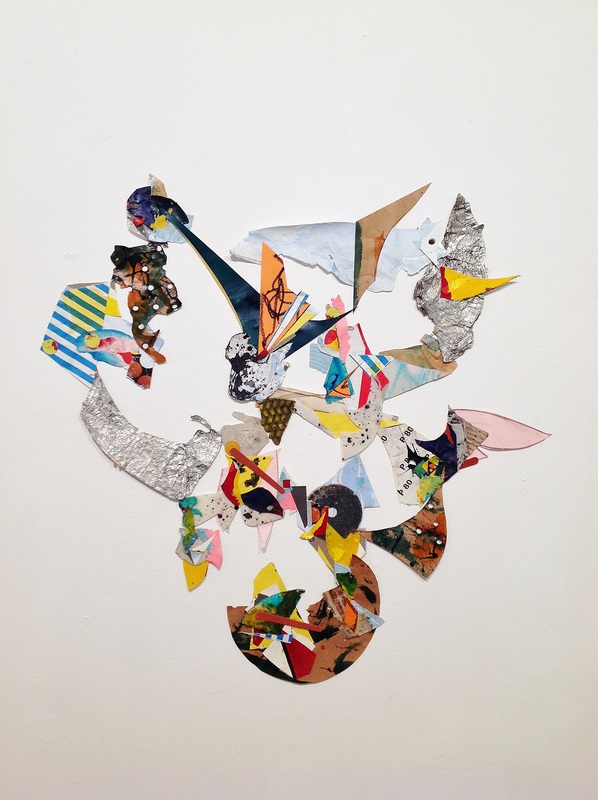 A superficial reading of Bunker’s lyrical-organic, rather than geometric category of collage, might suggest a disorderly arrangement of parts – as if a waste paper basket had been emptied. But then in careful consideration of all the constructions in Leave It, not one actually looked dissembled or unsystematic in any way. The apparently random is still structured. Even the loosest example, Tzila is constructed on a tight top-left to bottom right diagonal spine, making an arrangement in which half-a-dozen islands of vertical pockets of collaged formations dismiss any notion of chaos. In fact, the longer you look, the more at rest the component parts become. These balanced conjunctions create a counterpoint to the characteristic liveliness, formed from patchworks, zigzags and ‘urbanesque’ perimeter features that are endemic in all of these works. This sense of an inner-city counter decorum, such as in Skadwaz, might initially derive from the character and diversity of the materials as well as external associations that a viewer might impose. Essentially cut or torn, defined by edges as much as planes or shapes, an essence of the vernacular embraces the seemingly unrefined, recovered materials. Again, closer inspection reveals carefully scrutinised placement of the parts. For example, a thin strip of yellow paper (splitting into two linear fragments) at bottom centre connects a white patch to a dark blue piece of crazy paving; and the pale, loose, grubby plastic twine on the top right-hand side echoes similar, though more tightly restrained, stringy material on the left. 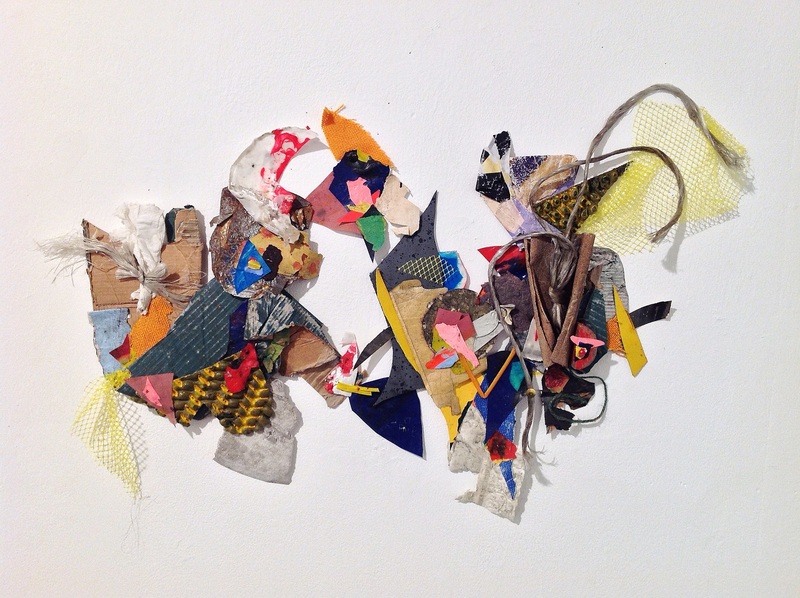 The various combinations of found material and fragments of painted papers from the (external) urban environment and the (interior) studio floor dissolve any dialectical distinction between the public (municipal) world and the artist’s (personal) world. Hinting at an implied subject matter beyond the collages, some of this resurrected detritus suggests a sense of place or at least derived from daily travels. For example, in Coney Island vertical stacking might inadvertently echo architectural forms. The notion of place also invokes the human habitat; although reading theses works as some kind of map or visual guide would be too literal and unimaginative. 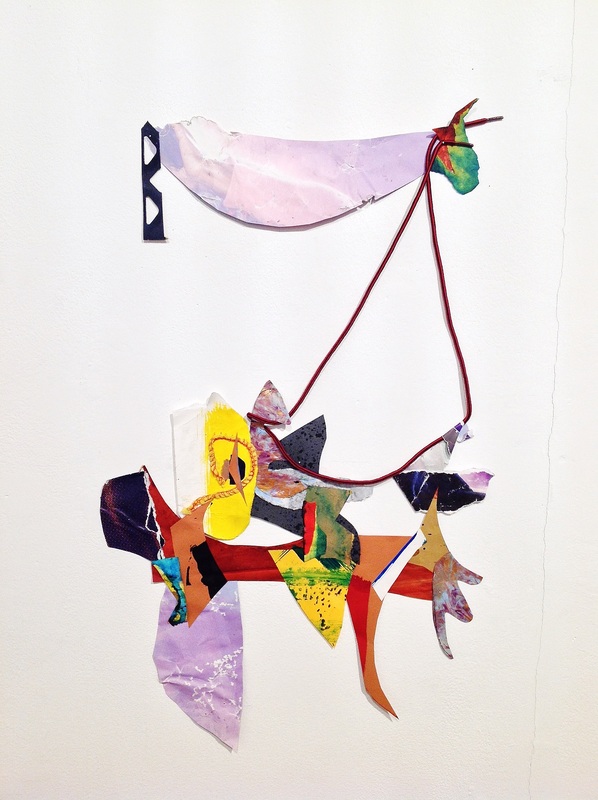 Perhaps there is an element of the psycho-geographic about these works, as a wandering spirit might have formed, or conjured, these matrices of collaged elements from a process of divination. The absence of frames for the works also eschews a sense of the grid type structure that invisibly designates a scaffold for pictorial composition and, instead, insists on the materiality of the component parts, which as collage are freed from the confinements of the frame or the unforgiving four-sided perimeter. “Pollux & Castor”. 2016-17. 96cmX94cm. Mixed media collage. 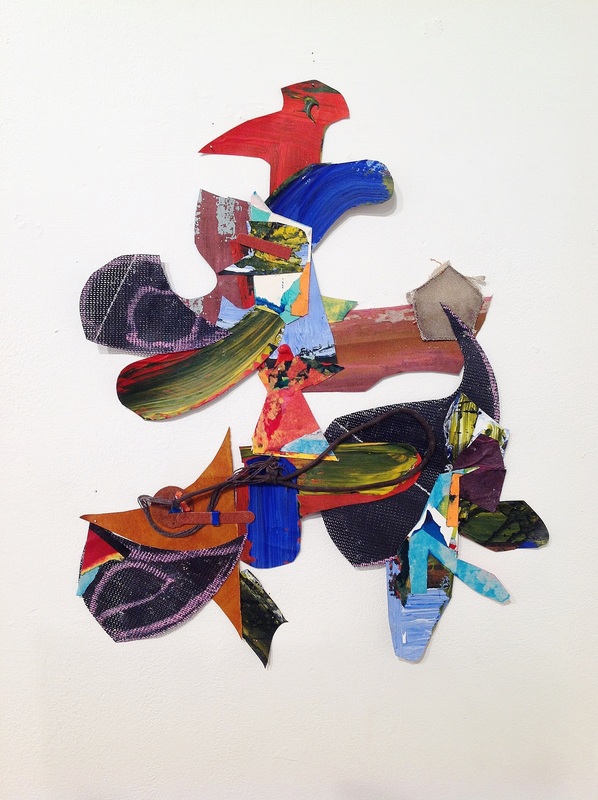 Collage could be regarded as a short hand substitute for painting – but this would be erroneous. 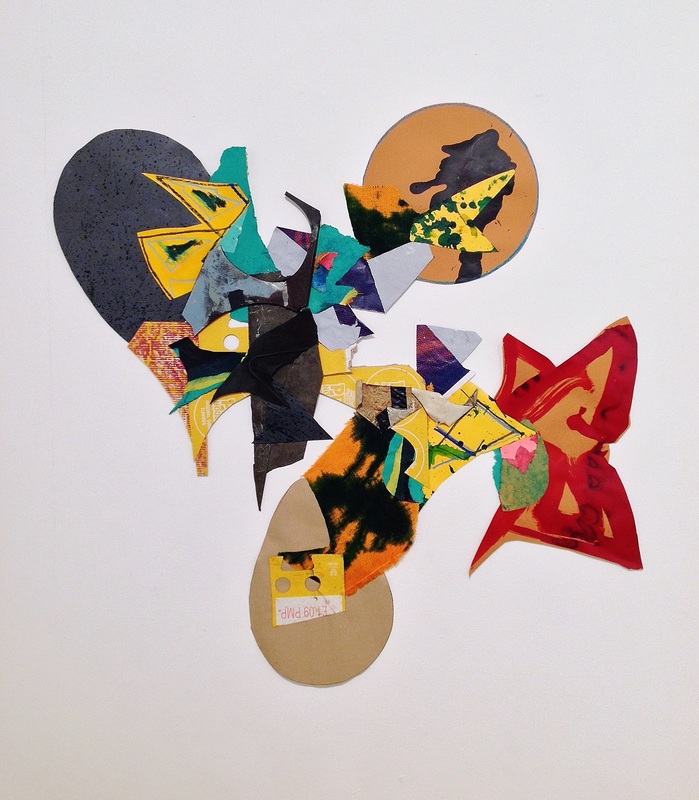 Bunker’s work successfully demonstrates that collage, as a process of addition and subtraction, is a medium in its own right. But Pollux & Castor, and Tjǫrn in particular, have a painterly quality, with the latter having the calligraphic feel of Chinese brushwork in its overall shapeliness and, as if to balance east and west, expressionistic gestural phrases within the various cut-out, leaf-like shapes. Bunker takes the spoilt or the abject (a scrap, a torn edge, a jumble of unrelated components) to be shifted and teased around, to be added and removed with nuanced precision, resulting in a combined symmetrical and asymmetrical equilibrium. Relationships are established between the various parts and the gaps and voids are distributed as contrapuntal spaces. There is also an intrinsic and subtly ironic absence of materials in these compositions, as the spaces that reveal the white wall on which each work is attached act as positive spaces and as medium. Viewing the sequence of the work around the four walls brings the space, or the immediate environment to mind. 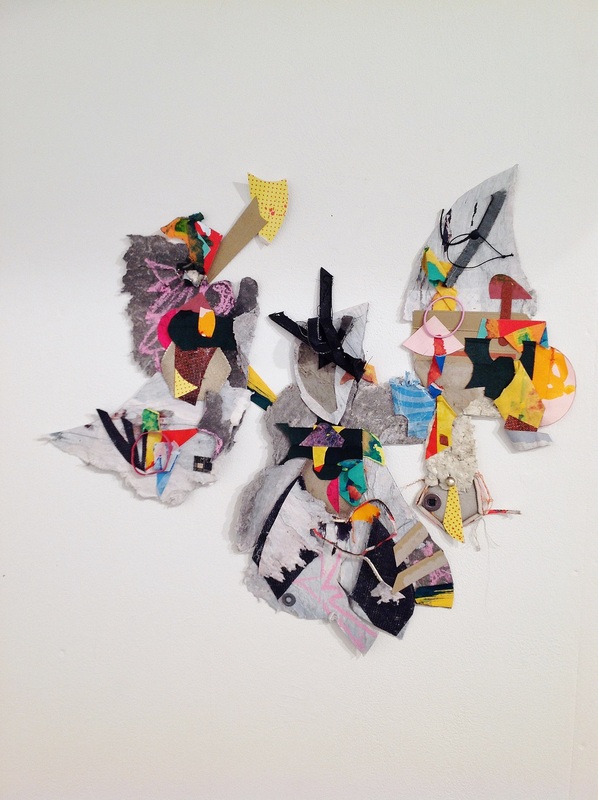 Are the collages made for this character of gallery space? Normally, non-functional interstices designate spaces that are superfluous and forgotten, but here the wall spaces are intimate and integrated in each work. The typical ‘white cube’ that characterises most contemporary art spaces is often intended as neutral but in Leave It functions with, between and inside the works – in which case, they are installation pieces. “Obygð”. 2017. 60cmX61cm. 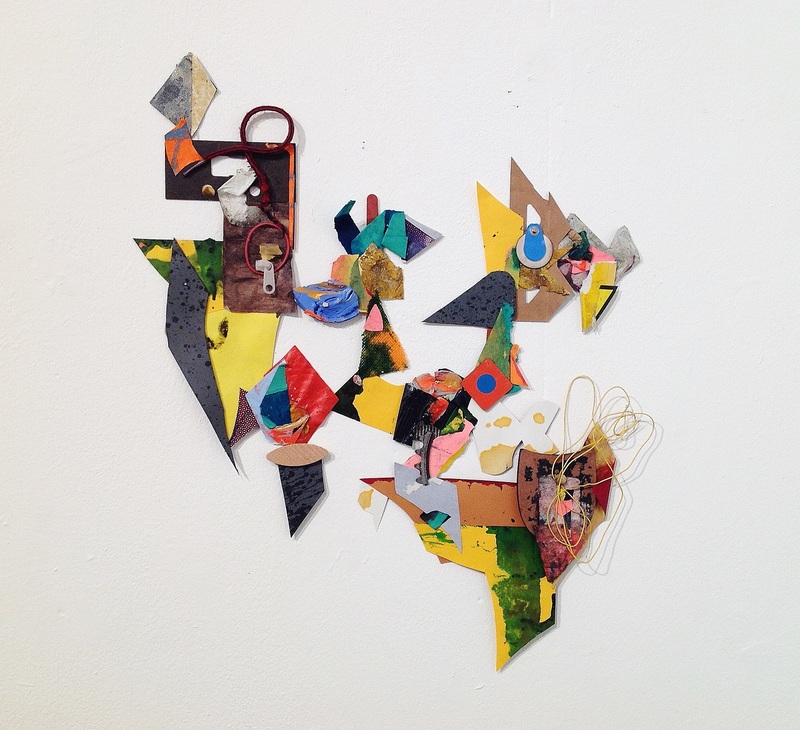 Mixed media shaped collage. If the relative smallness of these works (varied between 45X42 to 96X94cm) has an expansive potential and an extra-spatial dimension it is not as physical or visual extension or to the monumental, but in a more conceptual aspect. With this possibly contentious claim, the materials have a dual value or meaning. Going on my own intuitive senses (and without consulting the artist) is it possible that here we find an ‘Arte Povera’ spirit of making art from the abject and non-hierarchical, implying a political dimension that values equality and the commonplace over the pompous and precious materialism? Works of art are always open to reaction from observers – rightly or wrongly. But in this body of work I detect an implied invitation to participate in the action – a secular ‘sacra conversazione’: for what might this transformational materiality mean? To borrow a reference from an article written for Grizedale Arts by Robert Mead, John Ruskin’s proposal of ‘Relation’, from the first volume of Modern Painters (1840), associates the aesthetic with the idea, or the conceptual. The beautiful becomes intellectual, whereby thought is required as equally as aesthetic judgement of the formal qualities in a work of art. The ideas can exist independently of the artwork, as in concept-driven practice, though Bunker’s work is clearly not Conceptual Art. 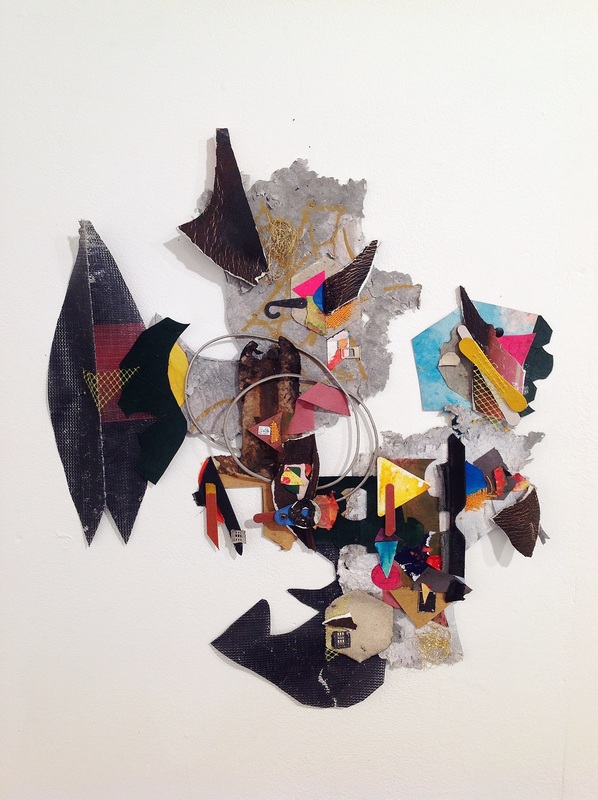 From a programmatic perspective, Bunker’s collages develop abstraction with a quiet, but determined, exploratory zeal. But what are the implied extraneous dimensions? Is the work confined to arguments and revelations within the narrow scope of ‘contemporary art’? (Does the undisguised use of ‘poor materials’ reject irony?) Or in the context of societies falling apart, or of experiencing unexpected change, these works hold chaos together as a positive antidote to despair? “Kalopsia”. 2017. 84cmX85cm. 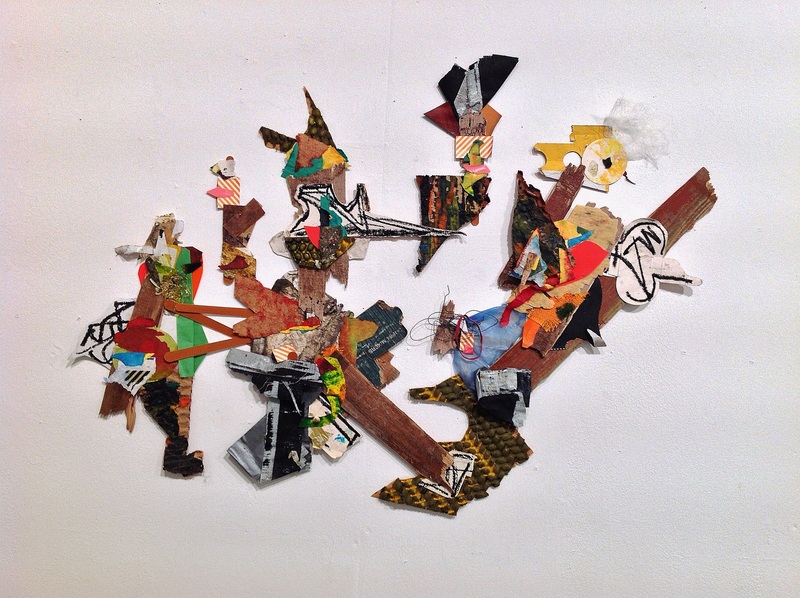 Mixed media shaped collage. Perhaps it cannot be explained, or even quite articulated clearly at this stage, but I am distracted – for the work has brevity and depth. The Barry Schwabsky quotations are from: ‘The Widening Circle’ (Cambridge University Press, 1979), ‘Abstraction, Representation in Contemporary Art and Criticism’ pages 7 and 9 respectively.